I love everything about boating. There is much to love. Boating allows us to see the world from a different perspective, free from traffic jams and endless ribbons of sun-scorched asphalt. On the water, I enjoy seeing dolphins play in the wake of my boat and spotting sea turtles and manatees swimming nearby. I love the rush of wind in my face and the cool spray that often accompanies it. Boating is a great way to connect with people. It is the joy of teaching someone to ski or wakeboard for the first time. It is the waves of laughter you hear when pulling a group of kids on an oversized tube. Well . . . I can identify one major buzz-kill that I having been seeing all too often recently. Yes, we all like to have a good time. And, yes, we were all young once, too. But even in my most reckless and carefree days, I would have never found any joy in getting sick all over my boat or being so inebriated that I was at risk of falling overboard. Unfortunately, the behavior I have seen from some young boaters in recent weeks has been more than annoying or obnoxious, it is frightening. I have done blogs in the past about being a sober Skipper, but this is more than that. There is a sadness in my heart that some young boaters think they have to consume excessive amounts of alcohol to make it a memorable day on the water. It’s one thing to have a few beers or a couple glasses of wine, it is just another to drink yourself into oblivion. When you mix too much alcohol with water, sun, and boating, there is a risk your day might end up unforgettable for all the wrong reasons. I know. I have seen it happen too many times. Arriving safely back at the dock after a day on the water should not be a matter of blind luck. It should be a matter of using good judgment. 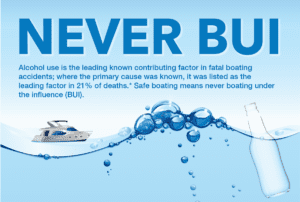 Be a smart boater. Be a sober boater. It’s not only more fun but you’ll save money replacing busted up items and save time cleaning up smelly messes.